1. Son of Geber; mentioned (I Kings iv. 13) as one of Solomon's district commissariat officers who resided in the fortress of Ramoth-gilead and had charge of Havoth-jair and the district of Argob. 2. 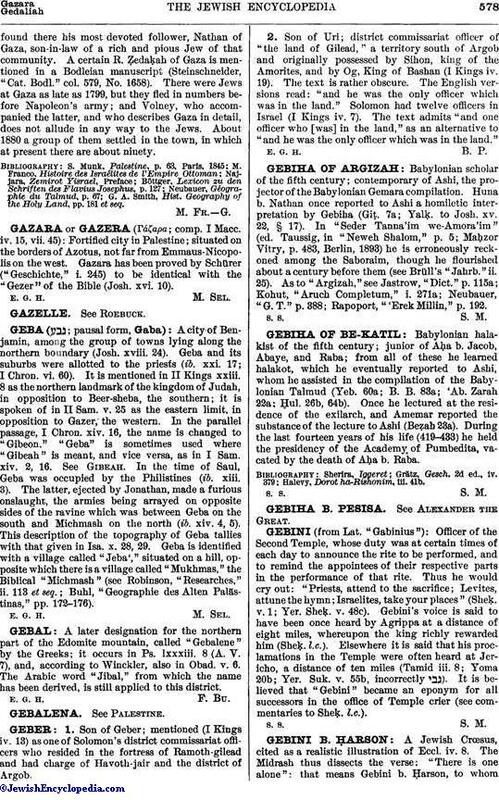 Son of Uri; district commissariat officer of "the land of Gilead," a territory south of Argob and originally possessed by Sihon, king of the Amorites, and by Og, King of Bashan (I Kings iv. 19). The text is rather obscure. The English versions read: "and he was the only officer which was in the land." Solomon had twelve officers in Israel (I Kings iv. 7). The text admits "and one officer who [was] in the land," as an alternative to "and he was the only officer which was in the land."